Allows for the prediction of liquid heat capacities of a compound at 20 Degrees Celsius . The prediction is based upon the group contributions of each individual component of the compound. Determine the chemical groups of the compound which the heat capacity needs to be determined for. Select the contribution value of each group by selecting relevant group structure buttons. I.e. 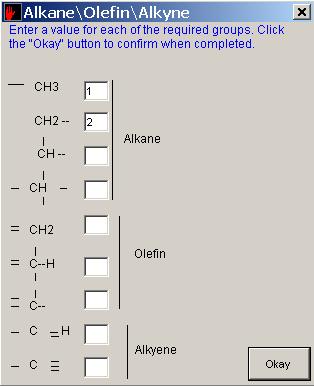 if the compound contains alkane groups click the Alkane/Oelfin/Alkyne button. Once the button is selected a form will be displayed showing all the groups available. For each group enter the number of times it appears in the compound, in the associated text box .i.e. if the compound has two methyl groups enter a 2 in the associated text box. Click the okay button of each form to enter the contribution value of the groups for the compound. A carbon group which is joined by a single bond to a carbon group connected by a double or triple bond with a third carbon group. A value of 18.84 should be added each time the above criterion is fulfil. For a --CH2-- group fulfilling the 18.84 addition add 10.47 instead of 18.84, but, when the ---CH2-- group fulfils the addition criterion in more than one way, the addition should be 10.47 the first time and 18.84 for each further addition. For any carbon group in a ring no such extra addition is required for such groups. Once all the contributions have been entered, enter the molecular weight of the compound and then click the Calculate button. 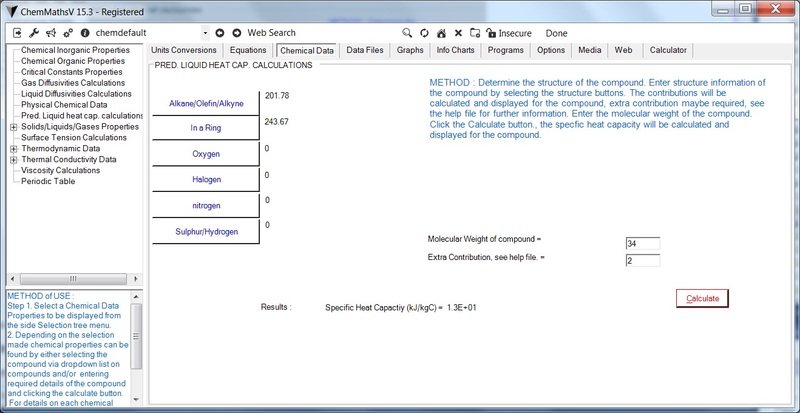 The predicted Specific heat capacity value for the compound will be calculated.